Go Libby, Go Libby, go! shouted tons of parents. 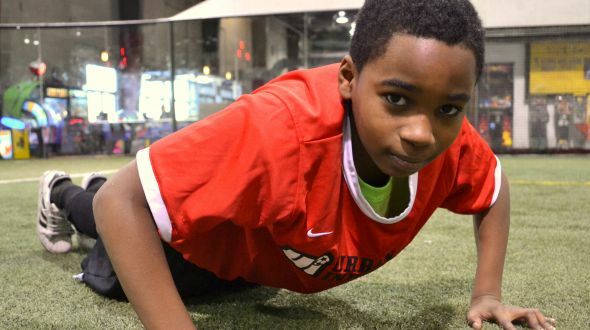 It was another fun filled game day for Urban Initiatives at Chicago Indoor Sports. Libby elementary school matched up with their neighboring schools Daley and Fulton elementary schools. Teams all arrived by bus to participate in their Friday Game Day. Libby arrived second, but they were revved up and ready to go! After Libby entered the field they recognized the familiar face of a memorable volunteer named Andy that used to volunteer as a helped set up the soccer fields before the kids arrived. Even though Libby players, mostly consist of smaller younger players they didn’t let that slow them down one bit! After all the teams were divided into their smaller groups of 5-6 players Libby began playing games with other teams. They played very hard against the opposing teams and put up a fight time after time! They played wonderfully and made their school and proud. They made their coach and assistant coach beam with joy as they watched them utilizing the skills that had been instilled in them. What made this day even more memorable was that Libby’s Principal Mr. Jones came out and supported his team on this eventful game day. It was a day full of smiles, sweat, and fun.